William Morrow Paperbacks, 9780062391483, 432pp. Some things aren't meant to be remembered . . . They're calling it the worst pileup in London history. Margaret Holloway is driving home, but her mind is elsewhere—on a troubled student, her daughter's acting class, the next day's meeting—when she's rear-ended and trapped in the wreckage. Just as she begins to panic, a disfigured stranger pulls her from the car seconds before it's engulfed in flames. Then he simply disappears. Though she escapes with minor injuries, Margaret feels that something's wrong. She's having trouble concentrating. Her emotions are running wild. More than that, flashbacks to the crash are also dredging up lost associations from her childhood, fragments of events that had been wiped from her memory. Whatever happened, she didn't merely forget—she chose to forget. And somehow, Margaret knows deep down that it has something to do with the man who saved her life. As Margaret uncovers a mystery with chilling implications for her family and her very identity, Everything She Forgot winds through a riveting dual narrative and asks the question: How far would you go to hide the truth—from yourself? 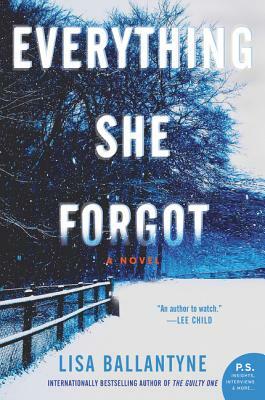 Lisa Ballantyne is the author of the Edgar Award-nominated The Guilty One. She lived and worked in China for many years and started writing seriously while she was there. Ballantyne now lives in Glasgow, Scotland.